Katia Papillon 72, light and dark blue dots on pale blue. 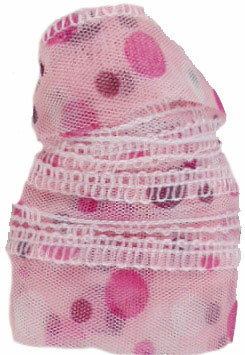 Printed net fabric scarf yarn with a mesh edge for an airy ruffled scarf. One skein makes a scarf, using 5.5mm needles. See enlarged view to download free pattern and instruction leaflet. 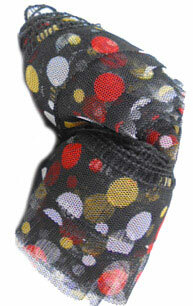 Katia Papillon 73, bright multi coloured dots on black. 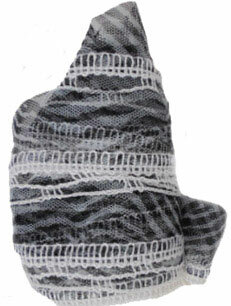 Printed net fabric scarf yarn with a mesh edge for an airy ruffled scarf. One skein makes a scarf, using 5.5mm needles. See enlarged view to download free pattern and instruction leaflet. Katia Papillon 71, light and dark pink dots on pale pink. 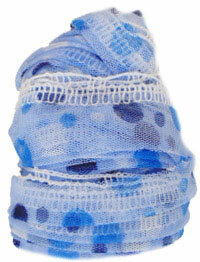 Printed net fabric scarf yarn with a mesh edge for an airy ruffled scarf. One skein makes a scarf, using 5.5mm needles. See enlarged view to download a free pattern instruction leaflet.